Explorer of Palestine; born about 1282 at Florenza, Spain; died in Palestine, probably in 1357. His father, Moses, sent him to study under his grandfather, Rabbi Nathan, at Tronquetelle, near Arles, France. At the age of nineteen he went to Montpellier to study astronomy with Jacob ben Makir; he also studied Latin, Arabic, and the works of Aristotle, Hippocrates, Ptolemy, and Galen. When the Jews were expelled from France, July 22, 1306, he went to Perpignan, where he remained for seven years, and translated several works. In 1312 he decided to go to Palestine. On his way thither he stopped for a few days at Cairo. Thence he went to Jerusalem, where flattering efforts were made to induce him to stay. He refused, however, because of the anti-Maimonidean feeling there, and settled at Bethshan, near Jerusalem. During the next seven years he explored Palestine, and laid down in his "Kaftor u-Feraḥ" his researches into the history, geography, fauna, flora, and antiquities of the Holy Land. He carried with him the manuscript, corrected by R. Baruch of Jerusalem, but it disappeared at his death. Fortunately, some copies had previously been distributed, and one was found in 1515 by Isaac Kohen Sholal, Nagid of Egypt. Between 1545 and 1548 it was printed at Venice by Meïr b. Jacob Frantz, who attributed it to the nagid. David Conforte was the first to ascribe the work to Farḥi. A second edition appeared at Berlin (1849, ed. Hirsch Edelman), and a third edition at Jerusalem (two vols., 1897-98, ed. Moses Luncz). 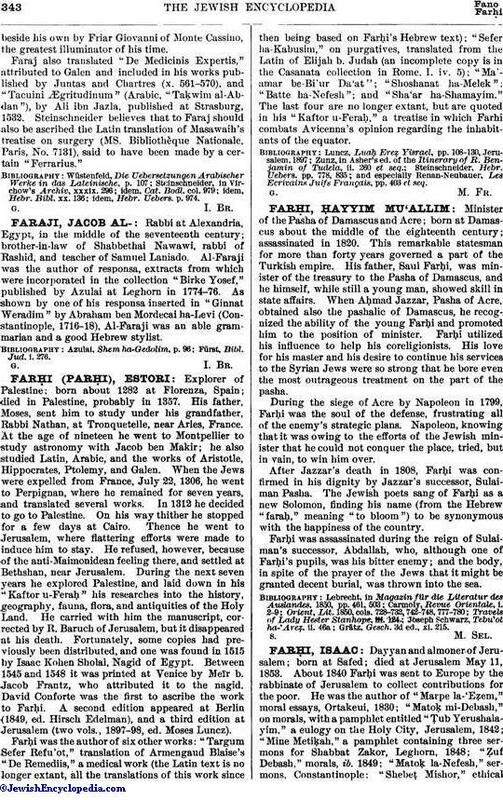 Farḥi was the author of six other works: "Targum Sefer Refu'ot," translation of Armengaud Blaise's "De Remediis," a medical work (the Latin text is no longer extant, all the translations of this work since then being based on Farḥi's Hebrew text); "Sefer ha-Kabusim," on purgatives, translated from the Latin of Elijah b. Judah (an incomplete copy is in the Casanata collection in Rome, I. iv. 5); "Ma'amar be-Bi'ur Da'at"; "Shoshanat ha-Melek"; "Batte ha-Nefesh"; and "Sha'ar ha-Shamayim." The last four are no longer extant, but are quoted in his "Kaftor u-Feraḥ," a treatise in which Farḥi combats Avicenna's opinion regarding the inhabitants of the equator. and especially Renan-Neubauer, Les Ecrivains Juifs Français, pp. 403 et seq.